In a slew of measures to combat inflation, the government today decided to scrap import duty on crude palm and soya oils and ban export of non-basmati rice and pulses. The decisions were taken at a meeting of the cabinet committee on prices at Prime Minister Manmohan Singh’s official residence here tonight. Under mounting attack following sexual abuse charges levelled against him by a woman Assembly employee, Orissa Speaker Maheswar Mohanty resigned today even as a key minister was sacked for allegedly instigating the woman to hurl the allegation. In a heartrending incident, seven bodies, including three children and one pregnant woman, of a debt-ridden trader’s family from Pehowa were recovered from the Bhakra Canal on the Kurukshetra-Pehowa road this evening. 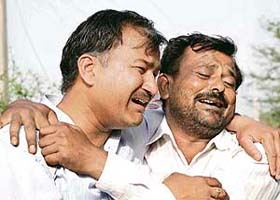 Relatives mourn for seven members of the Singla family on Monday. Should teacher who beat children be banned? Patients from 23 different countries; Dr Sharma's clinic treating patients from world over with homeopathy through Internet. The markets bid goodbye to Financial Year 2007-08 on a bearish note pummelling the Sensex more than 700 points. Taking a cue from the international markets, Indian punters sold most of the day bringing the Sensex down more than 800 points before settling marginally higher. New Delhi: The Supreme Court today dismissed three petitions filed by Birla family members against the Calcutta High Court order that denied them the right to raise objections to late Priyamvada Birla's 1999 Will. The police today arrested former Congress minister Singhi Ram and former chairman of the Himachal Board of School Education B.R. Rahi after the court turned down their plea for extending interim bail. 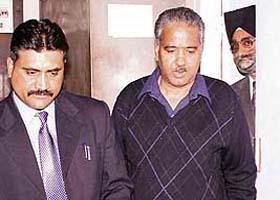 Former minister Singhi Ram (right) comes out of the district courts just before his arrest by the Vigilance in Shimla on Monday. China has asked the Dalai Lama to use his "influence" to stop violence in Tibet, in a first such statement which said the door for dialogue with him was "always open" but stepped up its crackdown in riot-scarred Lhasa, defying global pressure to exercise restraint. Supporters of Punjab minister Bikramjit Singh Majithia and Adesh Pratap Singh Kairon bagged most mining sites along the Sutlej at the auction of sand quarries falling in 65 villages of this district here today. The auction fetched the government a revenue of Rs 10.02 crore, against Rs 1.64 crore in the last auction five years ago.